Here is my card for this week's Ocean's 11 Challenge which I hosted: to use a Scripture or Quote on your card. I used my new Our Daily Bread Set "Sing to the Lord". I love this set! I stamped my image on Aquarello Watercolor Paper in Archival Jet Black, then watercolored with a combination of SU! Inks and Markers, plus a few Copics. The SU! colors are Baja Blue, Blue Bayou, Blush Blossom and Old Olive. The Copics are BG72, W1, W5, and E57. I had to just barely touch the paper with the Copics because Archival Ink will run with Copics, but it was fine since I used such a light touch and didn't go back and forth over the lines of the image. 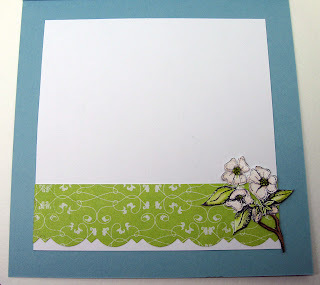 I stamped the image again and colored just the flowers so that I could paper piece them onto the first layer. I painted the birds and flowers with Shimmerz "Opal" after I was done watercoloring... LOVE Shimmerz! It adds the shimmer of Twinkling H2Os but is much more translucent so it does not hide your intricate coloring! Shimmerz can be found at the ODBD Store. I used the Our Daily Bread Sketch Challenge#3 for this layout. I used Baja Breeze for my base, and designer paper from Memory Box Sweetbay and Butterfield packs. I stamped the sentiment, which is Ephesians 5:19 directly onto my dp. I used my Nestie Small Classic Ovals and Classic Scalloped Ovals to cut my ovals. I also sponged Baja Breeze onto the oval behind the bird. I attached all my layers, and popped the bird up on dimensionals, then added a second layer of flowers, slightly curling up the edges. I don't think it shows in the picture but I dry embossed a corner pattern in the upper right corner, using a light box, stylus and an unknown brass embossing template. In the lower left corner I added three Dew Drops from The Robin's Nest "Lily Pad". On the inside I added a strip I punched with a Martha Stewart punch and another of the Dogwood clusters from the set. It also is painted with Shimmerz. I wish the shimmer would show up in the photo... it never does and that is frustrating, but irl it is very shimmery. I hope those of you in Ocean's 11 enjoy this challenge, and for all my visitors, I hope this card blesses your heart! Thanks for taking a peek at my blog! Have a blessed day! OH my goodness, Grace! This is an absolutely masterpiece! What stunning coloring skills you have! I'm very inspired by you and your marvelous work! Your blog is so uplifting and I'm just thrilled to have you gracing (pun intended, hehe) our dt this month with Clear Dollar :) hugs, friend! have a blessed day! Grace this is absolutely beautiful, love your new image and those colors and your coloring...fabulous!!! Fantastic card, love the inside too...so pretty! Ohh wowww Grace,what a beautiful card,l love the image and papers. I love love love your beautiful card. The design is just wonderful the colors are so perfect, it all fits together well along with the lovely wording. she is a true gift from God. This is so beautiful, Grace. My daughter's name is Grace too, but we call her Gracie. I'll go check out OBD right now. This is absolutely beautiful grace. Nice work! Gorgeous Grace! Wonderful colors, great scripture and I like that you popped the bird and some flowers up. So beautiful Grace!! This is one of my all time favorite stamp sets and I just love the colors you used with it! My dear Grace, this is truly a beautiful card, everything about it is so stunning - what a beautiful offering you have 'brought to the table' with this precious piece of art (and your heart!) This truly reflects your love for HIM - God bless you...and yes, your card has blessed me today!!! Thank you Grace, sister! 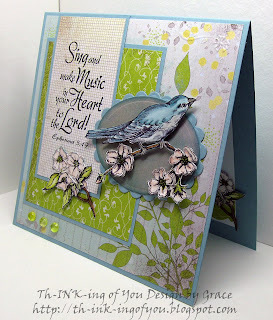 Absolutely stunning, Grace, and sooo inspiring...love the stamps, scripture, colors, papers, your cutwork, layout...OMG, girl, I love it all!!!! LOVE your take on the sketch and the dp you used!! 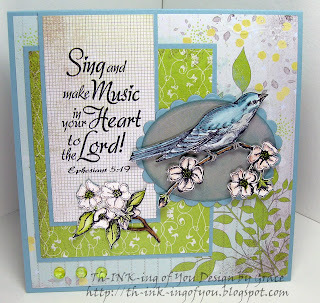 We love the Sing to the Lord set, too! So glad you played along!! This is just stunning! Love how you cut out the bird and layered it and the flowers! Great colors as well! Grace, your card is so beautiful!! That verse is probably my favorite ODBD verse! Thanks! This is lovely in everyway, Grace! Wonderful scripture and design! Grace this is just gorgeous!!!! This is so gorgeous! That bird is so divinely colored and the whole card is perfectly arranged!